It all started back in late 2001 when I became interested in obtaining an Amateur Radio License so that if I moved to some remote place without phones I would still be able to get hold of help. Well, I have always had a fascination with electronics and theory so once I started reading, lots more than was ever required for a HAM ticket, I found that the majority of the interesting electromagnetic spectrum was far from what we perceive in visible light. I became interested in searching the web for topics on radio astronomy and projects that could be put together with common, mostly free, stuff. Well, I found much more â€œstuffâ€ than I expected in and around my very neighborhood. My first attempt was to cobble together a simple yaggi and connect it to an FM radio receiver during a meteor shower. Well, that worked okay as I was able to hear a signal rise from a normally non-audible distant radio station as the ionization trails of the meteors reflected the distant signal back earthward. Okay, then came the curiosity with the sun. I had just found a great source of information and a newsletter that I could subscribe from a group called SARA. That is the Society of Amateur Radio Astronomers. You can check them out on the web at http://www.qsl.net/SARA/ and they have a newsletter that you can subscribe to if you wish. Well, getting deep into this I found that many were building radiometers using standard TVRO 3-meter dishes, the kind used for the now defunct C-Band satellites. For several months I scanned the neighborhood streets as I jogged and finally found what appeared to be a disconnected, and apparently abandoned 3-meter wire mesh dish. I made my move the next day and confronted the homeowner asking about the dish. Well, after a few minutes conversation and a discussion about the potential â€œscience experimentâ€ that I wanted to perform, he was more than happy to have me haul that massive dish out of his yard and save him the trouble of disposal. Now with a dish in hand, actually I stuck it on a wooden fence post that I got from the hardware store, and the kind donation of the old receiver for the C-Band system, I put together my first radiometer. Okay, one problem, I didnâ€™t know how to get a usable signal that I could somehow pump into the PC for analysis. That actually didnâ€™t take me long to figure out as I had read an article about one person constructing a simple analog output tap from a commercial, and inexpensive, satellite finder. I borrowed some feed-through capacitors from a buddy and went about converting the satellite finder into my signal source tap. The next problem was to get that analog signal into the PC. I fiddled around with the onboard sound card and the audio input and it worked for raw signal recording but I wanted more. I wanted to see the signals changing on my PC screen in some kind of software that I could use for analysis. I searched around again on the web and found a company that provided, free back then, a simple serial interfaced 4-cahnnel A/D board and software. Of course if Iâ€™d pay the big $15 they would send me a key that would unlock the full four channels for recording and saving my data to disk. I soon found that I was intrigued with Fourier analysis and the ability to show a sort of signal spectrum in my data. 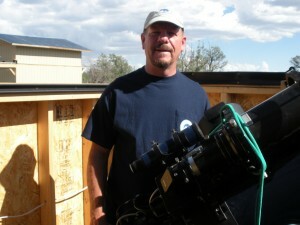 My first observing subject was, of course an easy one, the Sun. There were many small technical issues to resolve, like getting the dish to actually point at the Sun when it transited across the field of view. There were no motor drives on this baby so I have to manually position the dish to point to about the right elevation for the maximum transit height at noon local time and then hope that it was pointed close enough to catch some of the signal. Well after a couple of days and figuring out that I could use the Sunâ€™s shadow in conjunction with the dish and feed horn I was able to point it quite accurately. I made my first full passage recording and I was off. Next was the study of interferometers and what I could do with one of those two-dish babies. Then 4 more 3-meter dishes sprung up in the yard and with the erecting of each I got a scowl from the misses but she understood my passion for learning about stuff that others would find odd and she gave a hesitant approval. So I never actually got a good fringe from my solar observations but it was just because I had been using the commercial feed horns at 3.7 â€“ 4.2 GHz with the associated LNB (Low Noise Block Down Converter). To get a true interference signal requires that both the Low Noise amplifiers be down converted using a common oscillator unless one has access to much more sophisticated equipment. You know that most of the fun was in learning about what could be done and the theory behind it. So two years later my passion switched back to my old favorite, optical astronomy and the dishes have sat dormant ever since then. I did manage to donate one just two weeks ago to a student at Cal Poly who was working on a radio astronomy senior project. I understand that the dish is being mounted on the campus for others to use as well. I feel real good about the fun and learning process that I had building the systems and hoped that they could be put to good use by someone else. Indeed that has come to pass with this recent donation. Hum, I wonder what will strike my fancy next. Anyone want to wager a guess? I know, lets study far away binary star systems and even ones that eclipse each other.